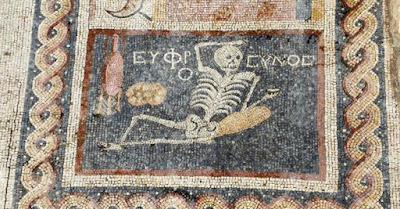 Last week, the "Cheery Skeleton" excavated in the ancient city of Antioch, Hatay in modern-day Turkey, was one of the main topics on social media. Originally it was reported that the ancient Greek inscription next to Şener (meaning merry, happy man, as he has been very aptly named) translated as "Be Cheerful, Live Your Life" (link). This was disputed by a journalist who claimed it was actually a warning about the effects of consuming too much food and wine (link). Whatever the inscription, it captured our 21st century imagination due to the meaning we associated with it. 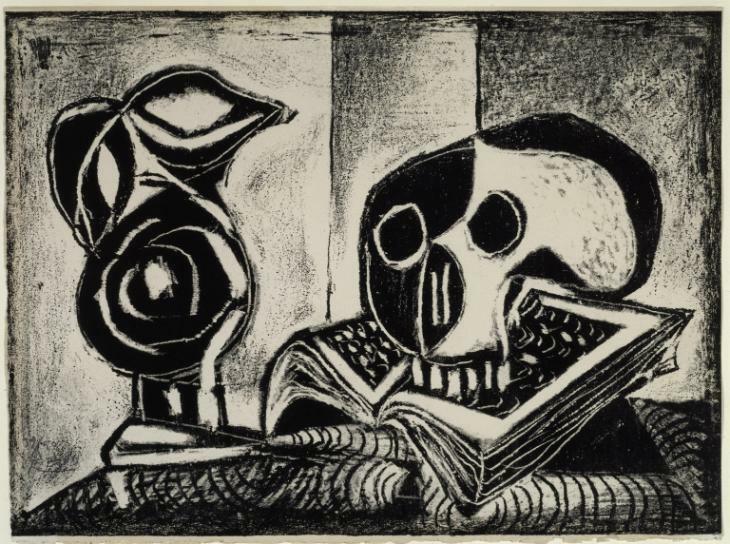 It was almost as if Şener's reclining figure next to a jug of wine and a loaf of bread was bringing a message of 'carpe-diem' to us from centuries ago. Just the type of message we needed to hear as everything around us was coming crumbling down. 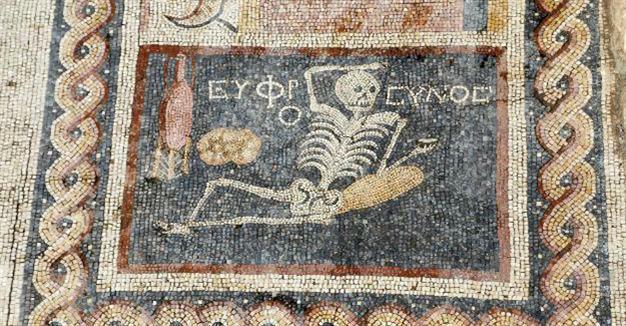 Actually Şener is not the only skeleton from antiquity with a message. 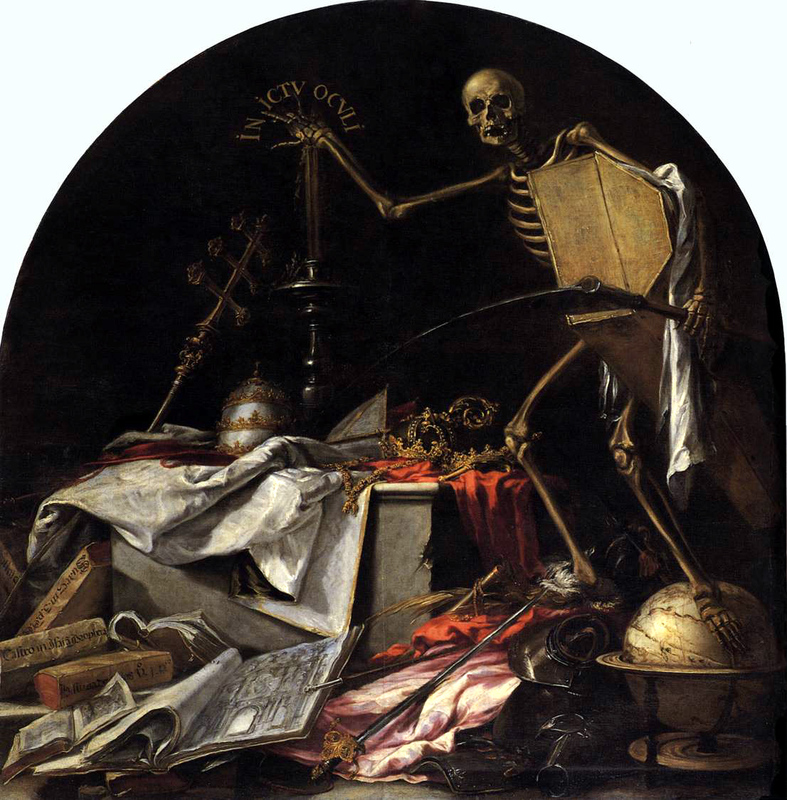 There is a comprehensive post on the history blog about the "Cheery Skeleton" which includes more images of skeletons from antiquity. 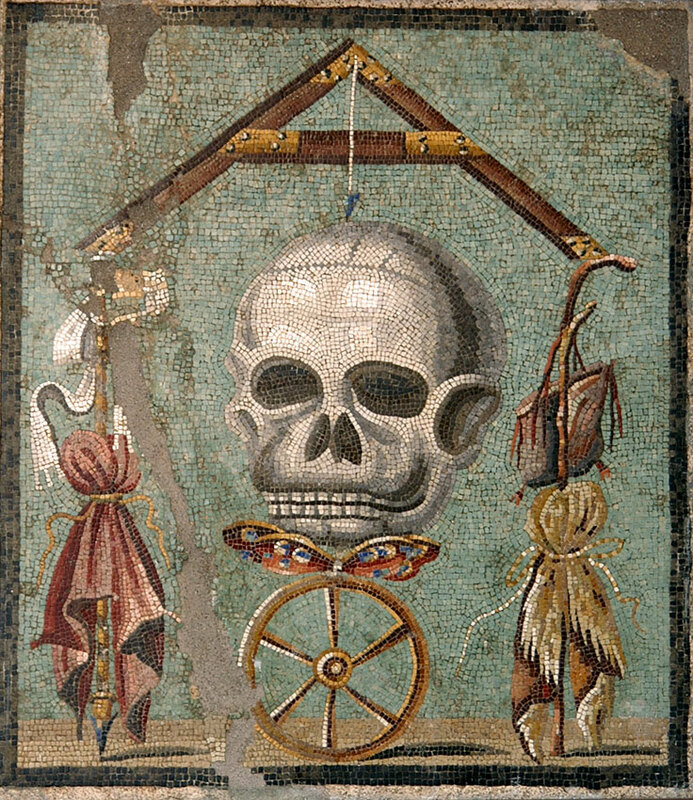 Of the numerous Roman mosaics excavated with skulls or skeletons, one of the most striking example has to be the mosaic from the triclinium of a House in Pompeii. 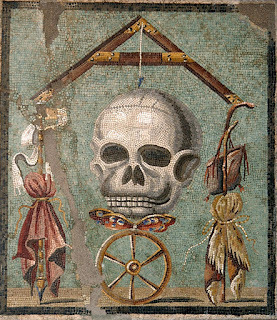 In this mosaic a large skull at the center is balancing wealth and power, represented with the purple and the sceptre on the one side and poverty represented by the stick and the sac on the other. The idea of death as the great equalizer seems to give comfort for those of us dissatisfied with our present world. For you, for me; nor attempt the Babylonian reckonings Leuconoë. Pluck the day, putting as little trust as possible in tomorrow! 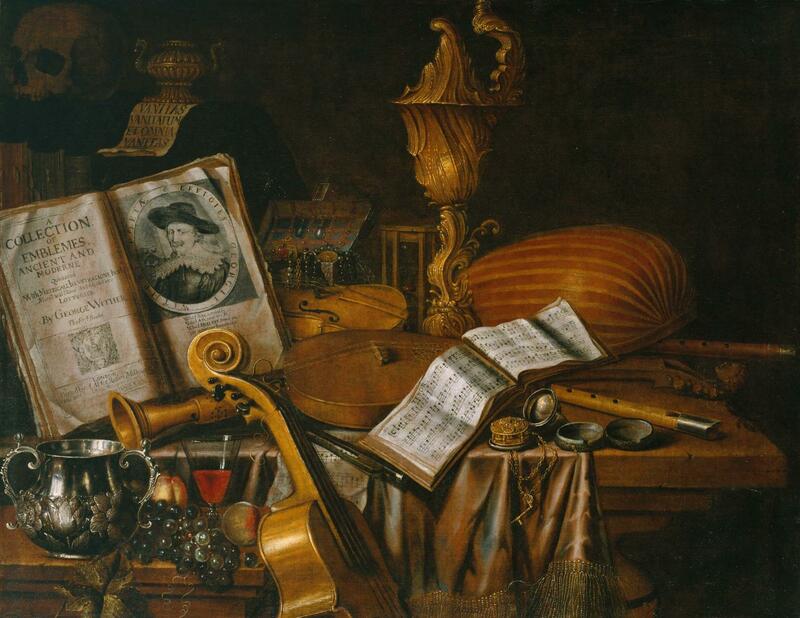 The transiency and the fragility of human life has been a favorite subject for artists for centuries. 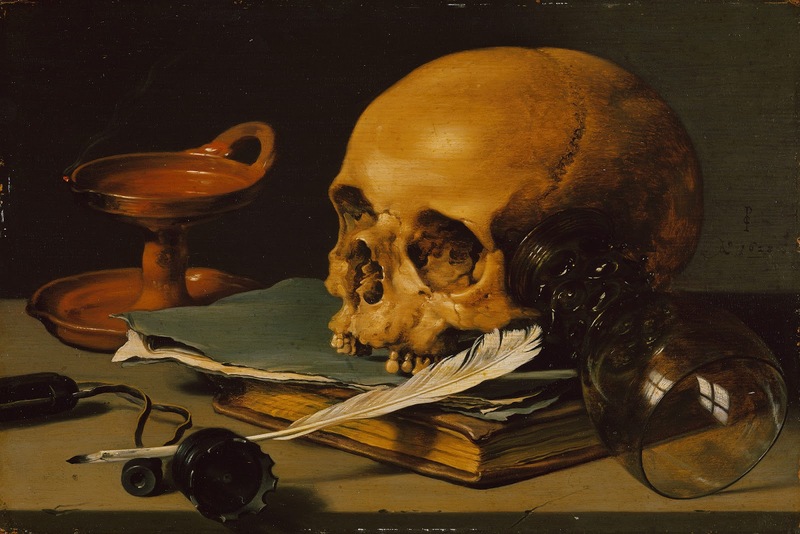 Memento mori (translates from Latin as remember you must die) paintings were a genre that developed as a category of still-life painting in Western art in the 17th century. 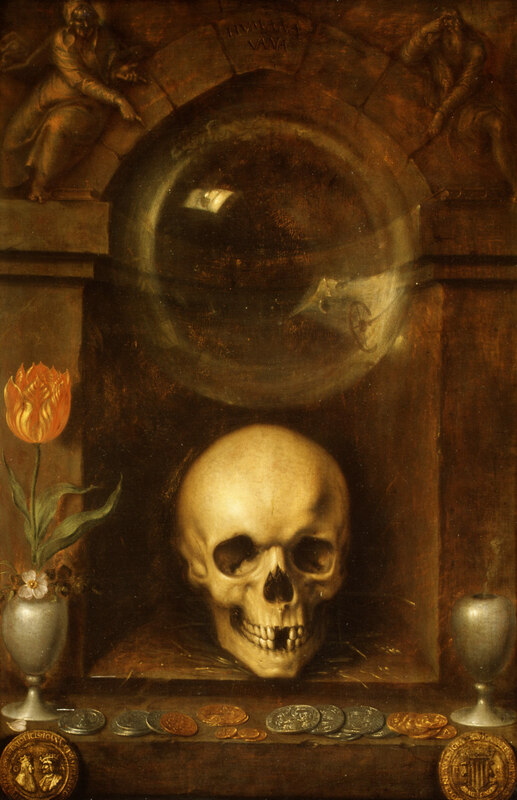 Moralizing canvases depicting skulls, extinguished candles, hour-glasses, pocket watches or clocks, flowers and even vegetables were reminders of the inevitability of death. Still Life with a Porcelain Bowl and Nautilus Cup has many of the symbols that can be found in other Baroque vanitas paintings such as the peeled lemon as well as the watch alluding to the passage of time. 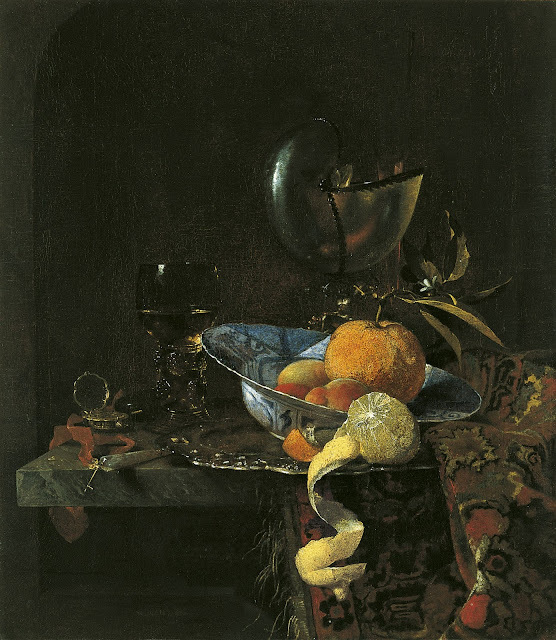 The half-eaten fruit is supposed to refer to the transient nature of life. 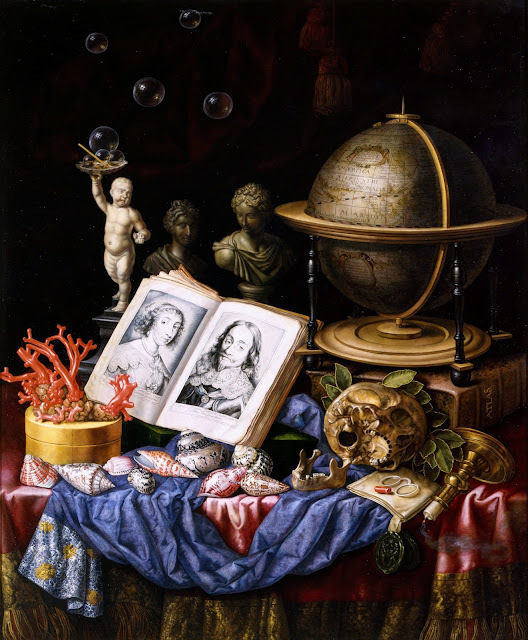 While there are religious connotations associated with Protestant principles, that the affluent Dutch merchant class felt a need to remind themselves, to these paintings, there is also a contradiction since the paintings themselves became the very things the viewer was being cautioned about - beautiful, expensive earthly possessions displaying their owners affluence and learning. It wasn't only the Protestants who moralized about the transience of life or the futility of pursuing earthly pleasures, in their vanitas paintings, Juan de Valdes Leal, the co-founder of the Seville Academy of Art was probably one of the most dramatic practitioners of the genre. In the Wadsworth canvas Valdes Leal actually paints the Allegory of Vanity, that not only includes the trappings from material possessions to fame and power but also intellectual and artistic pursuits. The painting of the Last Judgement revealed behind the curtain is the final reminder of the end of the world and fate of all humankind. 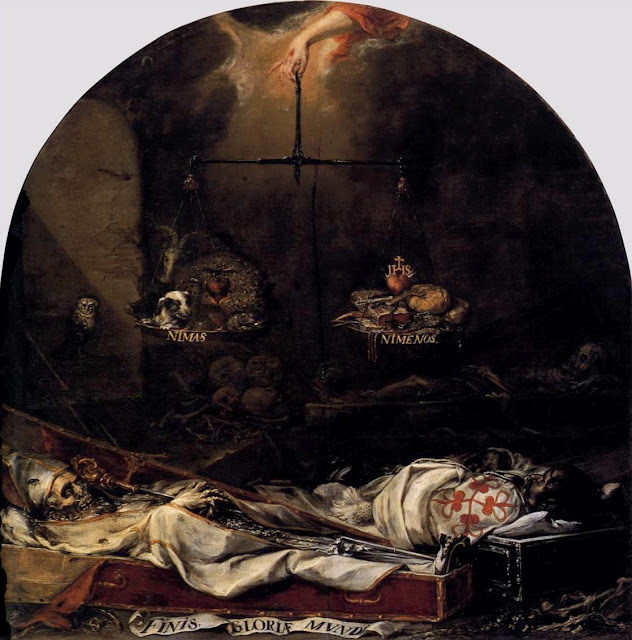 Two of Valdés Leal's works, End of the World's Glory and In the Blink of an Eye, that he painted for the Hospital de la Carded that took care of and burried the elderly and destitute are works that should hang in every palace, mansion or official residence of every dignitary across the world. 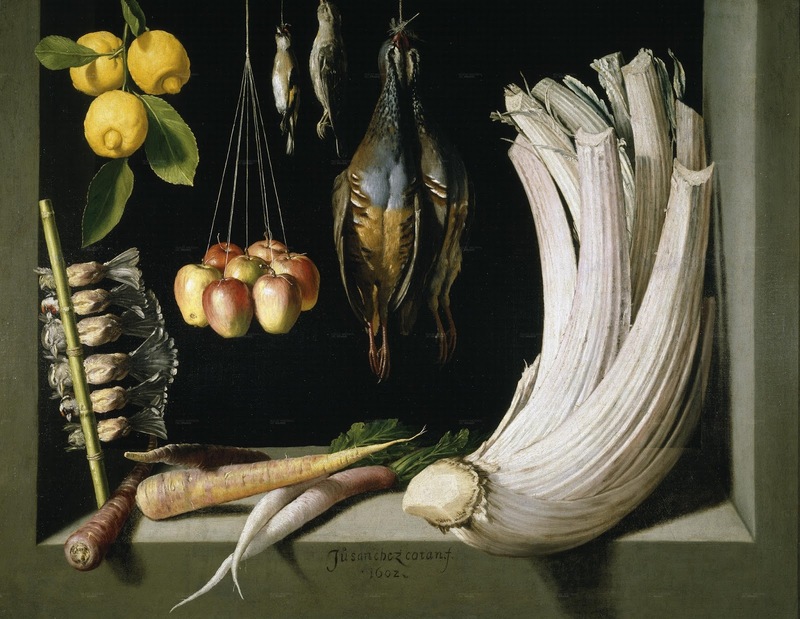 If the Northern European artists utilized beautiful flowers and luxurious objects to convey the message that life on earth was merely a preparation for the afterlife, the Spanish Baroque artists painted bodegónes with raw vegetables and dead animals displayed austerely in front of a stark, dark background. The word Bodegón was derived from bodega, meaning tavern, wine-cellar or pantry. Although lacking skulls or skeletons, bodegónes containing everyday objects and foodstuffs found in pantries are interpreted by art historians as having a moralizing vanitas component, which is why I decided to include them in this post. Juan Sánchez Cotán is an enigmatic artist who chose to close his workshop and join a monastery; scholars tend to interpret his still-lifes as the artist renouncing worldly goods. 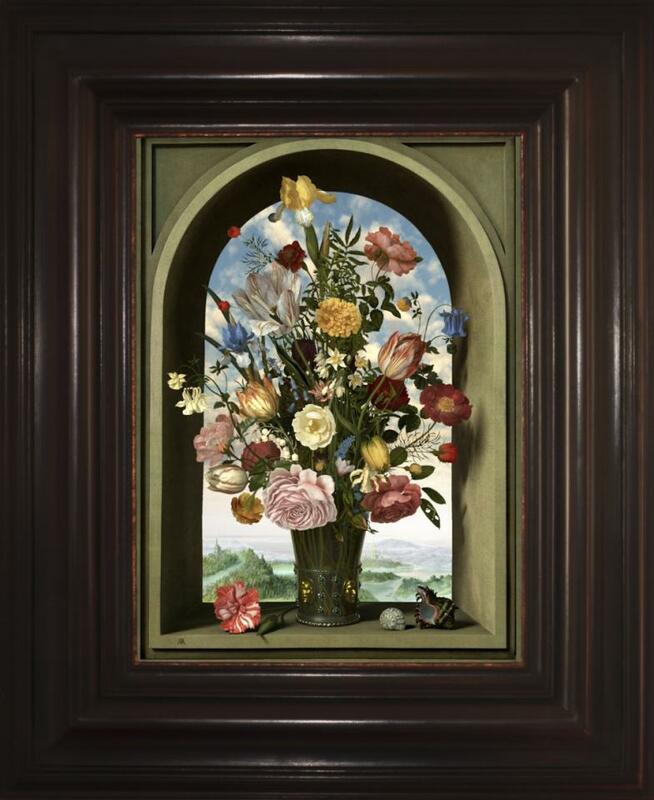 The picture Rob and Nick Carter start their digital painting with is a vase full of flowers recalling the Dutch tradition of still life paintings of a variety of flowers that would not be found in nature blooming at the same time, sitting in a windowsill, in front of a bright blue-skied landscape. As one stands in front of the work, insects start to fly around and flowers begin to wilt and eventually night falls over the landscape. 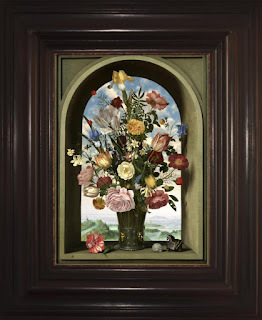 Transforming Still Life Painting at the Mauritshuis from Rob and Nick Carter on Vimeo. Finally, I guess I must conclude with a modern-day momento mori with an actual skull, the very contreversial For the Love of God by Damien Hirst. 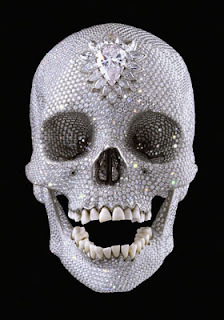 According to the artist's website, the provocative work is made with 32 platinum plates and set with 8,601 VVS to flawless pavé-set diamonds, weighing 1,106.18 carats. The work has a convoluted history with the highest asking price for a living artist of £50 million in its inaugural exhibition in London. The work was supposedly sold to an anonymous consortium (which included the artist himself) for the full asking price paid in cash. 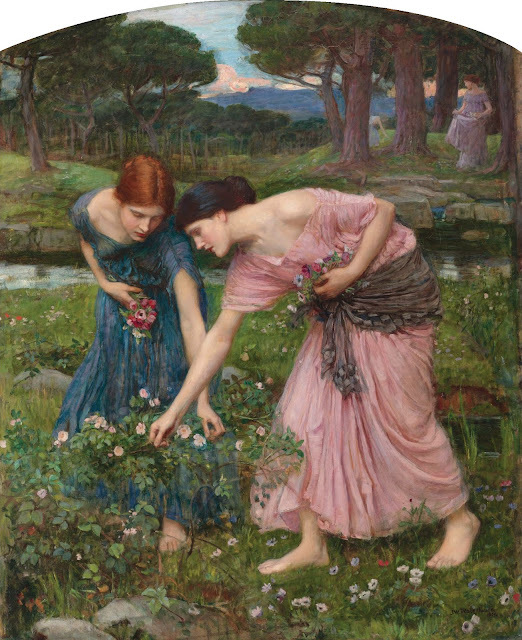 The reason this piece belongs among such great works of art produced throughout centuries is because it represents our contemporary society, the art world and its values so perfectly. 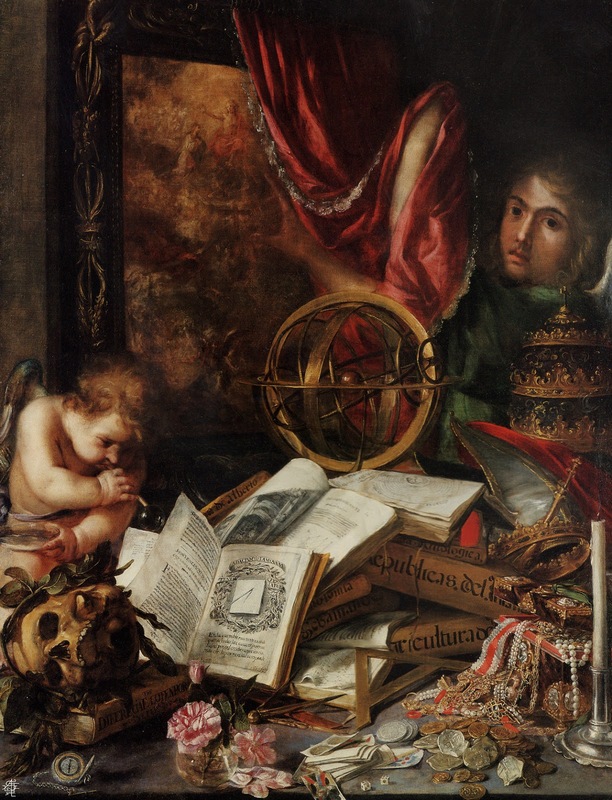 I hope the people who do invest in such pieces of "art" also own a momento mori or two to really contemplate their own mortality and what they can and can't take with them when they die.